These exercises are the key skills and techniques that you will build your programs around, as you will see later in the book. Once you have become familiar with a proper warm-up and the introductory kettlebell movements, it’s time to learn the classical kettlebell lifts. Along with each program, we also briefly discuss the primary movement patterns and qualities employed in the sport. 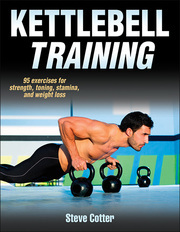 Renowned kettlebell expert Steve Cotter shares his training secrets in this authoritative guide. Packed with 95 basic, intermediate, and advanced exercises, Kettlebell Training provides complete coverage on getting started with kettlebells, creating customized sport-specific routines, and conditioning the whole body. Millions have experienced the benefits of the kettlebell, the ultimate training tool for fat loss, strength, stamina, and coordination. Effective and inexpensive, kettlebells are a training staple for top athletes and trainers around the world. Now, it’s your turn to see the impact and feel the results. Kettlebell Training is an easy-to-use, no-nonsense guide that will get you started setting goals, assessing fitness, and selecting exercises. You’ll learn how to exercise safely and efficiently to maximize results. Each of the 95 exercises is accompanied by step-by-step instruction, detailed photo sequences, and training tips—instantly accessible and perfect for at home or in the gym. Author Steve Cotter, a renowned kettlebell expert, martial artist, and certified strength and conditioning specialist, has trained elite athletes, professional football teams, Navy SEALs, and members of the U.S. Marine Corps. He has provided instruction to other kettlebell trainers in more than 40 countries, and now he is making this expertise available to you. More than exercises, Kettlebell Training contains proven programs that will produce results. You’ll learn how to create a routine based on your individual needs, goals, and schedule. Or simply follow the sample fitness, strength, and conditioning programs or one of the sport-specific routines, such as football, soccer, mixed martial arts, or tennis. Whether you are training for performance, appearance, or general fitness, Kettlebell Training has the exercises, programs, and advice you need for the results you want. It’s a complete guide that you’ll turn to again and again.